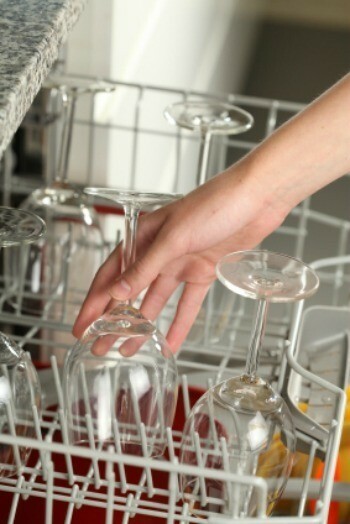 Dishes cleaned in a dishwasher can develop an unsightly buildup of white film. This is a guide about removing white film from dishes. It was either throw out my apple shaped dish, and several others if truth be known, or figure out how to get that ugly white film off of them. Elbow grease is not my favorite way of doing anything so desperation took over. I read everything I could and citric acid kept coming up. Well Fruit Fresh is basically citric acid and I happened to have some so I gave it a try. I put around 2 tablespoons in 4 cups of cold water and immersed my apple dish in it, 5 minutes later I checked it. I couldn't believe my eyes it was sparkling clear. No elbow grease needed. I dried it and put it in the cupboard looking like new. You must try it to believe and save your elbows! I have an old dishwasher and there was always a film on glasses. LemiShine worked, but was too expensive for the amount to use regularly. One day I bought Sunlight Lemonoxi complex powder. "No more film on the glasses." This same company makes Sunlight liquid and it works too. Now, since that was 3 of their dishwashing products which worked well, I am looking at all their products - one of which is Wisk laundry detergent which Consumer Guide rated as high as Tide - so I will try that and it is cheaper than Tide! The government started recommending a reduction in phosphorus in detergent back in the '70's and many dish washing detergent companies lowered the amount of phosphorus in their products over the decades since. Same for laundry detergent. Phosphorus runoff causes algae blooms, most common in the Great Lakes. The EPA and various other green groups and individuals dislike algae blooms because it sometimes kills the fish that need the oxygen the algae uses up. Eventually various State government felt the need to act, but without all the information, and banned phosphorus from various products. The companies that make dish washing and laundry detergent, rather than make different mixtures for different states, simply removed it. Whammo...white film on your glasses and gritty sand like particulates. Phosphorus is what prevents that from happening. Unfortunately, it was easier to target the consumer than farmers and industries that leach phosphorus into the runoff all the time. Phosphorous is a major component of most fertilizers. So while they are spreading it on the ground by the ton, the government went after us by the spoonful. Alternatively, municipal water treatment systems could have been retrofitted to remove phosphorous just like they remove a host of other chemicals we don't like to go into the water but again, it's just easier for the government and pressure groups to ban something than to think about alternate solutions. As far as a solution, go buy a box of trisodium phosphate from Home Depot and add some to your detergents. I use Cascade packs. I also use Jet Dry rinse agent in the rinse receptacle. My dishes have a white film on them. How do I get rid of the film? I use the same thing you do. Random film on the glasses one day, used lemon and/or lime juice (those lil plastic fruit shapes with lemon/lime juice in them that sits in your fridge forever, because you had that party that one time..) Squirted the juice in, filled with warm/hot water, let them sit for 5 minutes then swished it around in the glass and used a wash cloth. Film came right out/off. Vinegar is probably the best way to go, but the smell of vinegar makes me barf so citric acid for the win! I have been using Palmolive dishwasher liquid in my dishwasher. I have noticed that my dishes are coming out with a white film all over them. I contacted our local water company. They told me that the problem is not with the water. The problem is with the phosphates being removed from the dishwasher soaps. I have checked the different brands of dishwasher soaps, both powders and liquids, and they all seem to have the phosphates removed. Since the phosphates have been removed, what can I do to get the dishes clean and free from the white film when the dishes come out of the dishwasher? Thanks for your help. I never had problems till we moved and we have hard water now. My dishes and silverware were a mess. I started using Lemi shine. Works great. Found it the cheapest at Walmart. Here's another solution. CitriClean of Florida also makes a powder that you add to each wash cycle. It's all natural and contains no phosphate. The nice part is that you use 1-2 tablespoons of CitriClean and only 1 tablespoon of your normal detergent. I use the cheapest store brand detergent and it works great with CitriClean. Dishes and the inside of my dishwasher look like new again. My mom had the problem with white residue on her glasses. She tried the vinegar trick but it didn't work. She found a product that did the trick. It was a Finish product called "Quantum". It looks like a square yin yang with a red ball in the center of it. She has only had to use it three times in the past two months. Use them as needed I guess. Looks like you use one and it cleans things up for a few weeks until you need another. Fill dishwasher with residue dishes. Pour 1 cup white vinegar into the bottom of the dishwasher and run a normal wash cycle. The vinegar naturally dissolves any hard-water residue or film without harming the dishwasher or dishes. Add the vinegar to the dishwasher cycle every three runs or so, as needed to combat white residue. If you have severe hard-water issues, use the vinegar every time you run the dishwasher, especially when washing glassware. Everytime I run the dishwasher to clean my dishes, they always come out filmy with etching? We've tried several different dishwater tabs, but nothing helps. Why is this and are my glasses ruined now? I have found that for my machine the cascade gel pacs with dawn work the best and I get no residue. You may also want to try a product like jet dry that prevents residue buildup. Also may want to get your machine checked, maybe something is wrong. To remove the film, put around 1/3 cup clorox in with the wash or if you can catch the last rinse put it in then, you might have to do this a couple of times but it worked for me. Then the best combination for keeping the film from building up again in our water and our dishwasher is Lemi Shine for removing the white film and Palmolive dish deterrent jell. Every water is different and it takes a bit of experimenting to find the right combination. We have very hard water. Our appliance dealer told us to never use the gel packs, as the packaging will eventually build up in your dishwasher pump. Their repairman finds this problem a lot since the gel packs have become popular. White vinegar works well. Run it through an empty washer, full wash and rinse cycle. It works! I tried the less detergent route, and the vinegar, and clorox, and every detergent brand I could find, even trying the gel packs, liquids, powders, everything and my glasses still came out with that white film. Even Jet Dry didn't help. I even tried CLR to get the film off. Nothing! One repairman even told me to lower the water temperature. That didn't help either. Finally somebody told me that no matter what I do my glasses will always come out of the dishwasher with that film. (Don't understand it, Mom's never did!). But I've started washing all my glasses by hand and they are staying crystal clear. It's more time consuming, but at least my glasses are staying nice and I don't have to replace them every time I turn around! By the way, I"m not talking about crystal glasses, I'm talking about regular everyday glasses. I just read my manual for my new dishwasher and the troubleshooting section said you may want to try using a rinse aid and less detergent when this happens. I only half fill the receptacles and it seems to help. Try Lemi-Shine. It's in the dishwasher section. It's a dry powder type stuff. It is especially good if u have hard water. I had the same problem and my dishwasher was brand new. Was told about about his and it works great! Clean your dishwasher with vinegar or CLR which you can purchase at the hardware/grocery store. Hard water. Make sure you wash when you know your household use of soft water is good. We forget aftet alot of loads of clothes, showers. Search for CitriClean of Florida. They make a powder that you add to each wash cycle. You need to use only 1 tablespoon of the cheapest store brand detergent plus 1-2 tablespoons of CitriClean. So your cost per wash does not increase! All natural product that contains no phosphate. Does anyone know of a way to remove the milky haze (stain) that accumulates on glass's after being washed in the dishwasher repeatedly? It scrapes of with a finger nail, so the glass is not etched. Is there a home remedy, or a product I could buy? Please help. For the person who wants to remove the milky look from glasses after using a dishwasher. I put vinegar in the dishwasher where the expensive store stuff goes. It works great some of my glasses improved right away and some did after several washings. I have never tried it, but I have been told that vinegar will remove the stains. Good luck. Oooooooh I loved this one and it worked so well... I had a problem once where a plate blocked the soap dispenser in the dishwasher. The dishes came out completely dull, cloudy, and with a nasty texture, not to mention the ones that had food particles and other junk on them. I read that soaking the dishes in your sink in warm vinegar for 1 hour would do the trick. Well, obviously I didn't have enough vinegar to submerge all my dishes, so I improvised. I filled a tall pot with warm tap water all the way to the top, added about 2 cups room-temperature vinegar and submerged the glasses in it for one hour. It worked well, but I reused the water for the next batch of dishes, kept them in for 30 minutes and worked just as well. Then all my cutlery for 30 minutes with the same water and it did wonders. After each batch I hand-washed the dishes and set them out to dry. They are now sparkling clean. I heard baking-soda does the same (haven't tried it). I use (for safety reasons) plastic cups, toothbrush holders, etc., in the bathroom. When I put these articles in the dishwasher, they come out with an ugly coating. Some plastics are more prone to this problem. Any suggestions for keeping the plastic crystal clear? I just always wash this stuff by hand. 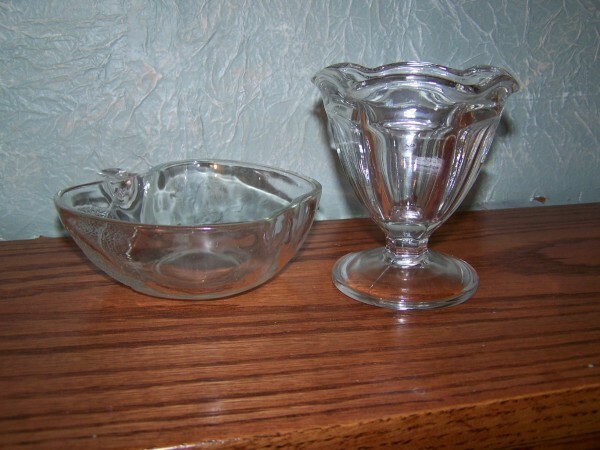 Being it is hard for me to stand I fill a bowl with hot soapy water and take to my table to wash the items, then I go back to the sink, dump that water and get clear water to rinse, then dry the items and they go right back to the bathroom. I never have trouble with my plastic food storage containers getting a film on them when done in the dishwasher. Is it a hard water film or a greasy film? If it is hard water, try a cup of vinegar in the final rinse. Also, try different soaps. Some are very prone to leaving a film, and may react differently in different types of water. If it is a greasy film, it may be coming from other dishes that are in the dishwasher at the same time, something like a plate with a lot of bacon grease on it, for example. All of my clear glass drinking glasses have a film on them from the dishwasher. I have changed detergent from Finish to Cascade, but no help. What else can be done besides hand-washing? My dishwasher is leaving a cloudy film on the glasses. I hand wash my dishes and there is a film on my glass bowls, but not on glasses. I have been using Dawn. Is there a solution to getting rid of this film? My daughter did not let me know that we were out of dishwasher soap and proceeded to use the liquid Jet Dry as soap. Every dish had a chalky film on it. The plastics washed clean after a few washes, but the glass glasses are still chalky looking after several weeks of use. I thought of trying to clean them with vinegar, but wasn't sure if that would help. Anyone ever deal with something like this? Yes, vinegar will work. Run your dished though a complete cycle and add vinegar to the water when the machine fills.You can even add the vinegar several times throughout this cycle This should take care of the film on the dishes! Try soaking your glasses in white household vinegar. I would first run a load in the dishwasher with 2 cups vinegar and no soap. If this doesn't work, you will probably need to soak them for a few hours. This has always worked for me. How do I clean my dishwasher? My dishes have a film on them. I'm in Tucson and just about 2 weeks ago started having the same problem (again). The only thing I've found that works is a product called LemiShine. I found it at Fry's and it's kind of expensive (about $5 for a container like a smallish coffee creamer). It was in the dishwashing section. I put regular detergent (I use Great Value from Walmart which is rated as highly as Cascade Complete, but is a lot cheaper) in the pre-rinse cup and LemiShine in the main cup, then run as usual. Everything came out clear and the film was gone. How do I get my glasses to come out of the dishwasher clear instead of with this milky looking film on them? You can't feel the film or taste it, but it makes my glasses look terrible. I am using the borax and washing soda dishwasher soap mixture as well as white vinegar in the rinse aid holder. My dishes are still coming out with a white film on them. I have tried the light wash, the normal wash and the pots and pans wash settings on my dishwasher. Nothing is helping. How do you get white film off glasses from the dishwasher? It's a new machine and the glasses look foggy.